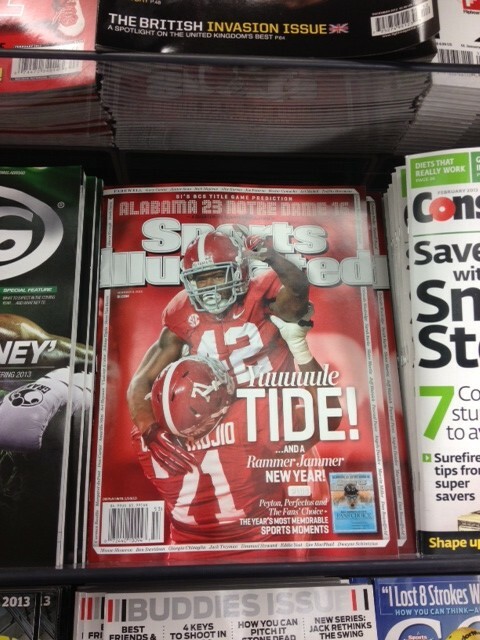 The Power Rank founder Ed Feng predicted Alabama’s win over Notre Dame on the cover of SI. You stroll into your friend’s house for the Super Bowl between Denver and Seattle in February, 2014. “What do you think about the game?” he asks as you grab a Two Hearted Ale from the fridge. “I like Seattle,” you reply. “Seattle played a tougher schedule in the NFC West. San Francisco 3 times, twice against an underrated Arizona team,” you say. Your friend offers an intrigued look. He’s waiting until the game starts to see if you’re full of crap. Seattle dominates Denver in the Super Bowl. It begins with a safety on Denver’s first play of the game and gets worse as Seattle returns a tipped Manning pass for a touchdown. Even without defense and special teams scores, Seattle outscores Denver by a comfortable margin. “How did you know Seattle would win?” your friend asks you. Hi, my name is Ed Feng, and I’m the founder of The Power Rank. While I’ve been a life long sports fan, I never thought I would work in the industry. After getting my Ph.D. from Stanford in chemical engineering, I was one of many looking for an academic job. I discovered the paper behind Google’s PageRank, the algorithm that started a billion dollar company. This algorithm sorted the complicated mess of the world wide web into search results that magically gave you the right website. I realized that this algorithm was based on the same math as my research in statistical physics. This discovery inspired me to develop a new algorithm for ranking sports teams. I calculated some NFL rankings and sent an email off to my friends. Their interest inspired me to look at other sports. Now, here I am, writing for you. What has this experience taught me about computer ranking systems? Let’s look at 5 important factors in The Power Rank and other good ranking algorithms. It should be obvious that a team ranking system should consider margin of victory in games. Do you care that Amazon has lower prices than your neighborhood book store? No. It’s the 40% discount on all titles that compels you to buy online. The same lesson applies to computer rankings. However, many well known rankings systems do not use margin of victory in ranking teams. The primary example is the Elo ranking system developed in the 1960’s. With the power of modern computers, it’s time to move past a system designed in the era of pencil and paper calculations. And don’t even get me started on the RPI rankings that the selection committee uses to pick teams for the NCAA men’s basketball tournament each year. In a nutshell, computer ranking systems take a statistic like margin of victory and adjust for strength of schedule. That’s it. This adjustment is more critical in some leagues than others. American college sports and international soccer have a huge disparity in the strength of teams. Beating Spain and Italy by a goal means something much different than beating Indonesia and Tahiti by the same margin. This adjustment is less important in leagues such as the NFL in which a salary cap levels the playing field between teams. However, it can’t be ignored, as the Super Bowl between Seattle and Denver showed. In all sports, the home team wins more often than the road team. A ranking system should adjust the final margin of victory in a game for this factor. For example, suppose Pittsburgh beats New England by 3 points at home. However, NFL home teams win by about 3 points. Hence, the margin of victory is zero for this game. While home field advantage is still mysterious, there has been some interesting research into its causes. Check out the book Scorecasting by Tobias Moscovitz and Jon Wertheim for compelling evidence that referee bias is one factor that contributes to home advantage. As mentioned previously, a good ranking system also gives each team a rating. The difference in the rating between two teams implies a point spread. In my NFL rankings, the spread between the best and worst team is less than 20 points. With this typical spread, how does a ranking system account for a 59-0 win by New England over Tennessee (an actual game during the 2009 season)? It can’t simply say that this game means New England is 59 points better than Tennessee, give or take home field advantage. Good ranking system give diminishing returns for a large margin of victory. Winning by 10 instead of 5 means much more than winning by 55 instead of 50. To be honest, I never designed this feature into my ranking system. I was actually a bit worried about how overrated New England might become after destroying Tennessee in 2009. However, New England didn’t rise too much. The diminishing returns for blowouts was a nice little present from the math I developed. Suppose you have a statistic like average margin of victory to rate a team. You want to adjust a team’s raw statistic for the strength of schedule. This gives the rating of a team. For example, suppose the New England Patriots have won their games by an average of 7 points. However, they have played 3 teams that each have a negative margin of victory. You develop a method to adjust these margin of victories. New England’s raw 7 points per game drops due to its poor competition. After you make this adjustment for all teams, you’re left with a new set of margin of victories, or ratings. So you do this again. If you’re method works, these ratings will converge to a final value. Beware ranking systems that iterate once or twice. They will do a poor job of accounting for strength of schedule since the ratings have yet to converge. If adjusting for strength of schedule seems like an after thought in the method’s description, that’s probably a bad sign. Instead, look for ranking systems that solve for the unknown variables (in this case, the ratings) simultaneously. One way to do this is iteration. However, there are many other ways to perform the calculation as well. Computer rankings provide a data driven, unbiased look at team sports. They’re useful for predictions as well. My algorithm ranks teams based on a rating, or an expected margin of victory against an average team. The difference in the ratings of two teams gives a predicted point spread, give or take home field advantage. While blindly wagering based on these predictions will not work in the long run, use them to back up your own judgments and find value in the markets. To check my predictions based on team rankings, click here. I use my Stanford Ph.D. in applied math to make football and March Madness predictions. To get a sample of my best American football predictions and March Madness cheat sheet, sign up for my free email newsletter. Enter your email and click on "Sign up now!" Do you make these 3 mistakes with college football statistics? © 2019 The Power Rank Inc., All rights reserved. My March Madness cheat sheet makes it drop dead easy to fill out your bracket. It's based on my analytics which have predicted 71.2% of tourney game winners since 2002. To get this free service, sign up for my free email newsletter. No thanks, I'll make predictions without data and analytics.